"The greatest blessings come by way of madness, indeed of madness that is heaven sent." Socrates on The Oracle of Delphi. When the ancient peoples around the Mediterranean Sea basin wanted wisdom from the gods, they went to oracles. An oracle was a person who spoke (orated) for the gods in various temples. During the time Israel was in Babylonian captivity (6th century B.C. ), a ruler in Smyrna, Lydia (modern Turkey) named King Croesus wanted to find the best oracle in the world, one with powers to divine the future better than all others. So in 560 B.C., Croesus sent his emissaries on a 100-day journey to the seven most popular oracles in the world with a question: What is King Croesus doing today? To eat turtle soup mixed with lamb's meat prepared in a bronze pot was exactly what Croesus was doing on that particular day. This dish was not typical cuisine for kings, especially one as rich as Croesus. Amazed at the Oracle of Delphi's prescience, Croesus sent emissaries back to Delphi with gifts of gold and silver for the Oracle, and they asked additional questions. The Spartans consulted the Oracle before the Battle of Thermopolae, a turning point in the war between the Greeks and Persians, expertly portrayed in the recent Hollywood motion picture 300. Alexander the Great traveled to Delphi to consult with the Oracle before he set off to conquer the world. Socrates often went to Delphi from Athens with his students. The Oracle once declared Socrates, the wisest man among the Greeks. This led Socrates to say, "This one thing I know: I know nothing." Yet the Pythia's pronouncement made such an impression on Socrates that it propelled him into a lifetime of learning by asking questions of others, something we now call the Socratic method of learning. Every major Greek and Roman leader, soldier, or politician would either personally travel to Delphi or send emissaries to Delphi to consult the Oracle. The influence of the Oracle of Delphi only dissipated after Emperor Constantine converted to Christianity and the Roman world adopted Christianity as the official religion of the state. The Pythia were common women from the village of Delphi who had been chosen by the priests of the Temple to serve as the Oracle. The word common defines ancestry, for some of the women from Delphi who served as Pythia were slaves. The word common, however, does not define their physical beauty. Greek and Roman historians often commented in their writings on the striking beauty of the Pythia at Delphi. This beauty seemingly was a prerequisite for being chosen as a Pythia. 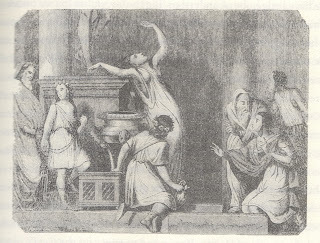 In her divination room would be the naval stone (omphalos) which marked the Temple as the center of the world, a golden tripod upon which the Pythia would sit as she greeted guests, and across the room from where the Pythia sat was the alleged tomb of Dionysius. The Temple of Apollo was built on intersecting geographical fault lines at Delphi. The Pythia would sit on her golden tripod over two intersecting crevices in the earth which seeped ethelyne, ethane, and methane--a cocktail of non-addictive but highly hallucinogenic gases. Contemporary Greek historians recorded a strong, sweet smell filled the Oracle's chamber, the tell-tale sign of ethylene, one of the world's first anesthetics. The Pythia would remove a cap from the naval stone (see picture to the left) that sat beside her chair, releasing the hallucinogenic gases that had collected underneath the naval stone which sat on top of the X of the fault lines. As the gases released, the Pythia would enter into a conscious trance as she considered the questions presented to her. Swaying back and forth, she would eventually utter her answers. The priests did not invent answers from undecipherable utterances of the Oracle but faithfully recorded what the Oracle said. The Oracle would give a lucid, sometimes cryptic answer, in either poetry or prose. 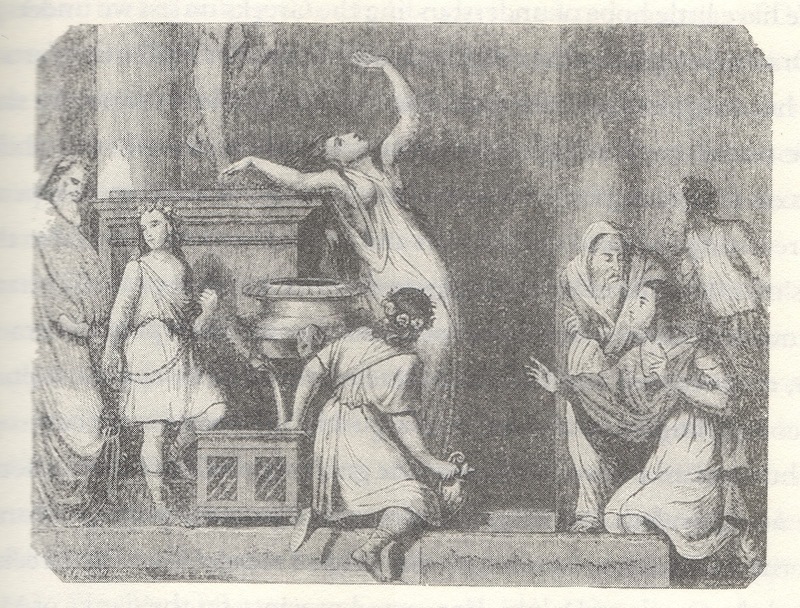 Plutarch called the Oracles of Delphi "inspired maidens." The answers to the questions posed to Oracle would be given to the supplicants, who considered the poetic responses to Apollo's direction for their lives. Entire nations would wait with baited breath for an answer from the Oracle at Delphi. It is not an exaggeration to say that a woman's words ruled ancient civilization. When the Apostle Paul visited Philippi (51 A.D.) during his second missionary journey, he and Silas were followed by a young girl for many days who kept crying out to the people of Philippi, "These men are servants of the Most High God who are proclaiming to you the way of salvation" (Acts 16:17). Many Christians have a hard time understanding what Paul did next. But Paul, greatly annoyed, turned and said to the spirit, 'I command you in the name of Jesus Christ to come out of her! 'And it came out at that very moment. (Acts 16:18). The only way you can understand why Paul did what he did is to realize the biblical description of this young girl. The English versions of the Bible say she had "a spirit of divination" (Acts 16:16). The literal Greek word used to describe this woman is Pythia. She could have served in the Temple of Apollo in Delphi, or she could have been a lesser oracle. What we do know is she had the spirit of divination. She followed Paul and Silas and spoke of them as being spokespersons of Zeus, the Most High God, and said the people should listen to their words of deliverance in the same manner they listen to the words of an oracle. Of course, the Pythia was misrepresenting Paul and Silas. She was possessed by a demonic spirit, and Paul delivered her. Michaelangelo would later paint the Pythia of Delphi on the ceiling of the Sistine Chapel, but the Apostle Paul showed no such reverence to the Pythia he met in Philippi. One should always remember that all that glitters in organized religion is not gold. When the Pythia's masters saw their hope for profit in Philippi was gone, they seized Paul and Silas and dragged them before the authorities and demanded the disciples of Christ be imprisoned. Paul and Silas were thrown in jail where they would later lead the jailor to faith in Christ (Acts 16:31). The story of the conversion of the Philippian jailer and his family is a vivid reminder that God orchestrates all events (like the Pythia's actions at Philippi) for His glory and the ultimate good of His people (like the Philippian jailer). (Originally published by Wade Burleson in 2013 as The Apostle Paul and the Oracle at Delphi). A servant girl declaring PAul and Silas were servants of the Most High God? That's a reminder that even the devil and his minions are servants of the Most High God. Unwilling, but still servants. Witness satan and the events at Golgotha. All who proclaim Christ as the Way do not always know Christ as the Way. So, to be clear, there is no intellectual or spiritual connection you want to make concerning the SBC? "All who proclaim Christ as the Way do not always know Christ as the Way." I write about history and the New Testament, and only SBC when needed. Glad to hear that. A lot has been said about the SBC and I was hoping this was not going there. I love history. I am learning, learning, learning. My freshman year of high school, I was plunked into an elective Greek and Roman mythology class for juniors/seniors for my "study hall". I was so fascinated by the class that I didn't get any proper studying done! I love the posts based on mythology! Is it true that the oracles often shaved their heads as a sort of "open for business" sign to welcome spirits of divination? I read a theory once that, since Paul said womens' hair was given to them as a covering, this was the reason women were told not to prophecy with their head uncovered--so one could tell the difference between a Biblical woman prophesying through the Holy Spirit and a pagan oracle prophesying through a demonic spirit. (1 Corinthians 11:5-6,15) Just wondering if you've come across anything similar to that theory??? If you'd rather not hear the podcast, there is a reference to a journal article. Heiser appears on first aquaintance to be out in left field with his focus on ancient semitic theological cosmology, but I find that his arguments make a lot of sense, and may help to understand OT passages that are otherwise puzzling. Jerry, I had not heard the theory, but is an interesting one with possibly some merit. While the Fat Lady is still warming up her vocal cords :), Terry Mattingly Comments June 1, 2018 wrote: “In the early 1980s the big news in American religion back then was the conservative revolt in the giant Southern Baptist Convention. The leaders of this revolt were Texas Judge Paul Pressler and the Rev. Paige Patterson. They guided the winning side in the great SBC civil war over "biblical inerrancy" four decades ago. Thanks for you caring heart. Sorry for the delay in replying to your question about my ankle. It’s a long story…I believe the best doctor God gave us is our immunity system. Its first line of defense is our tonsils. Because of a ‘fad’ mine was taken when I was ten years old. Very important is the spleen. Mine was ruptured and removed because a ladder twisted and I fell from a tree 12 years ago when I was 74. Also had five broken ribs and a broken pelvis. I’d lost so much blood Dr. Hayes said and an hour later and I’d not made it. Life is in the blood. Years later I was on blood thinner and had gotten sick on spoiled hotel yogurt. The gagging tore blood vessels. I was in a hospital in ten minutes where machines recorded I had stopped breathing. My wife yelled at me to breath but I was unconscious. They put blood directly into my heart. I didn’t care for a small scratch on my ankle and it caused a ‘venous ulcer’. Dr. Hayes had switched from being a surgeon to removing bad veins. He removed all the surface veins in my leg with four ‘laser-vein surgery’s’ that cost me $2,295. Other doctors said that was a horrible thing to do as it restricted blood flow and cause a worse condition of ‘cellulous’. I’ve gone to hospitals three times, seen 22 doctors, and taken a ton of anti-biotics in 4 years. 25 days ago my ankle was draining so bad a Veterans Administration (VA) doctor said it looked like something out of ‘Star Wars’. Four days ago, the VA doctor could hardly believe my ankle looked almost well. “What have you done?” I said for two weeks I had been using some medicine made from roots of shrubs grown in Romania that our song director gave me. (He is from Romania.) I showed them a picture of it. They wrote the name down. (Tataneasa) and asked if it could be bought. I said only in Romania.